The Charisma Diamond chemistry: A patented matrix and newly developed nano-hybrid filler system result in improved aesthetics, durability and handling. This means minimum shrinkage and shrinkage stress, very smooth surface, high resilience and optimised surface hardness. The Charisma Diamond versatility: Charisma Diamond adapts to the colour of the surrounding tooth structure for an outstandingly natural look. Whats more, the Charisma Diamond layering technique is a distinct aesthetic advantage and ensures virtually undetectable restorative margins. You easily achieve very good results with single shade technique for simple cases and excellent results using the multi-layer technique. 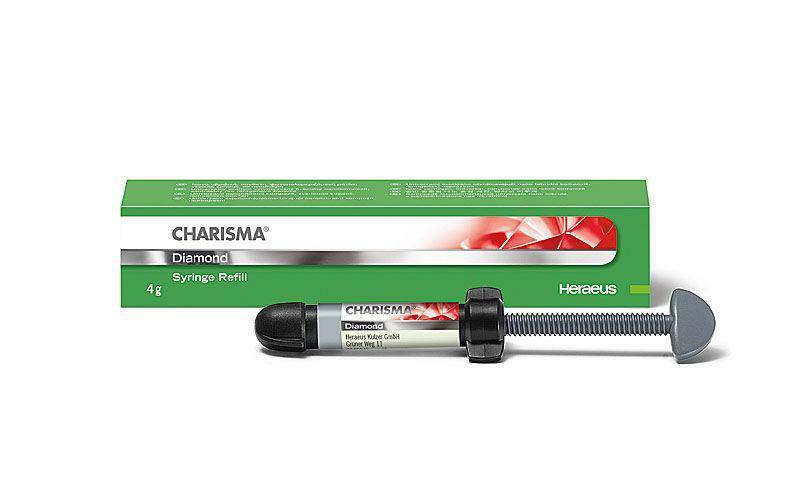 The Charisma Diamond workability: Charisma Diamond offers minimal stickiness and improved efficiency during sculpting. It also provides an extended working time even if illuminated by operating light. Ultra-fine filler particles create a polish that is comparable to natural enamel.